We provide the best of the Domain Renewal Services. The Domain Name is in fact your internet web site address or a URL to identify you and your business. Furthermore it is the name through which your probable customers actually identify your association or services that you provide. In short the Domain Name is your identity on the net. 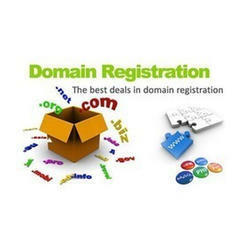 Domain Name comes with variety of extensions which includes .com, .net, .org, .name, .in, co.in, .info, .biz etc. Each of these extensions are best suited as per the industry. We provide dedicated hosting solutions by offering managed servers dedicated to your website. The Web Guru Web design also provides Renew of Domain. Renew your domain names today to ensure this critical asset remains part of your business portfolio. Renew of domain should be done on the time so that it can't effect on the promotions. Renew of domain should be done before the expiry of the website. VMS VEDA WEB offers several cost-efficient modes of domain and website hosting services. Each of our effective hosting services is designed to meet your business and individual needs. We facilitate you with the best of high-performance web servers. MakemyDesigns provide you very exclusive web hosting & Domain name registration services like domain name transfer, domain name renewal at lower fees and with good technical support. Register your own domain; upload your site on reliable servers with 99% uptime and a complete user friendly control panel. Please call us or send us your detailed requirements. Call us for best rates in Windows as well as Linux based hosting.